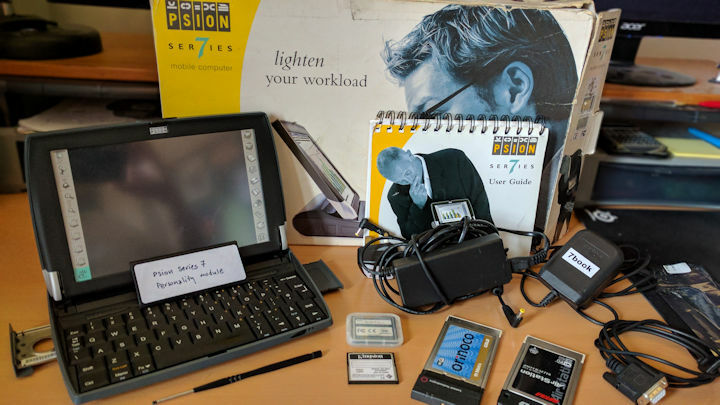 My Psion archive has now been sold. This is the first day in 21 years that I’ve not had a Psion computer or book in my possession. Many thanks to everyone who got in touch regarding these sales, and especially to the lovely Psion enthusiasts who purchased these machines. They gave me a great deal of joy over the years, I hope they serve you equally as well. This was the last Psion that I bought—it must have been early 2004. I bought it to take to the US with me on holiday, and for a couple of writing projects I was working on. 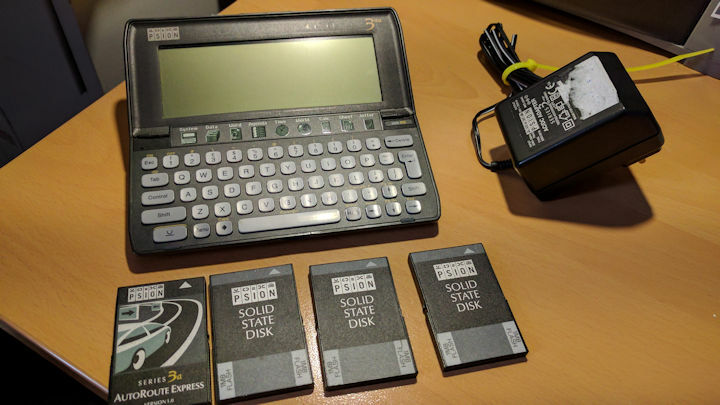 It was a Series 7, bought on eBay, and later upgraded to a 7book by fitting a Psion netBook personality module. This made it capable of accepting a wi-fi adapter card (I bought two, one each of the two main chipsets that work well with netBooks). DVD containing all the Psion software I collected over the years; I used to sell this online. I bought the 5mx shortly after moving to Edinburgh, from Inverness in 2003. It was another eBay purchase and was to replace my Psion 3mx. I just wanted a new piece of kit. It has a 32-bit operating system, a beautiful clam-shell case, where the keyboard slides out when you open it, and a backlit, touch screen. What more could you want from a PDA? This Psion was my workhorse for many years. It’s solid and dependable, and I don’t ever remember the screen cable breaking, which was the most common fault these machines suffered. I did have it fully refurbished a couple of times, though, from the dependable POS Ltd in London, run by Paul Pinnock. Something I loved about the 3mx is how long the batteries lasted. I could usually get about one month’s use out of a pair of AA batteries. 4 x solid state disks (3 x 1MB and AutoRoute Express software). 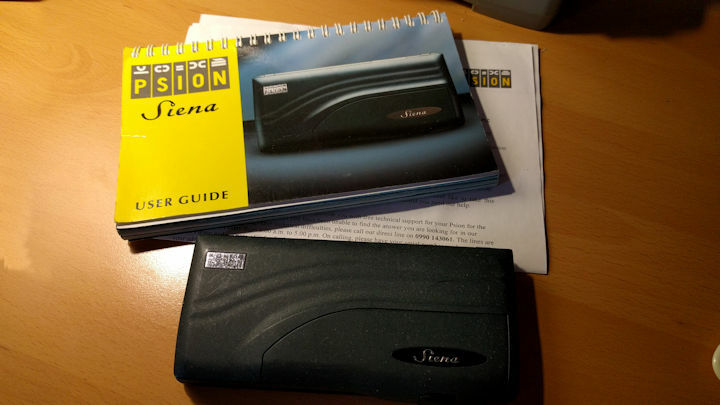 I saw an advert for the Psion Siena in a copy of MicroMart, I think it was. And I immediately fell in love with it. I pondered buying one for weeks before getting up one sunny morning in my flat and travelling to London’s busy Oxford Street to purchase it at Debenham’s department store. It immediately became my diary, contacts list, to do list, journal and programming machine. 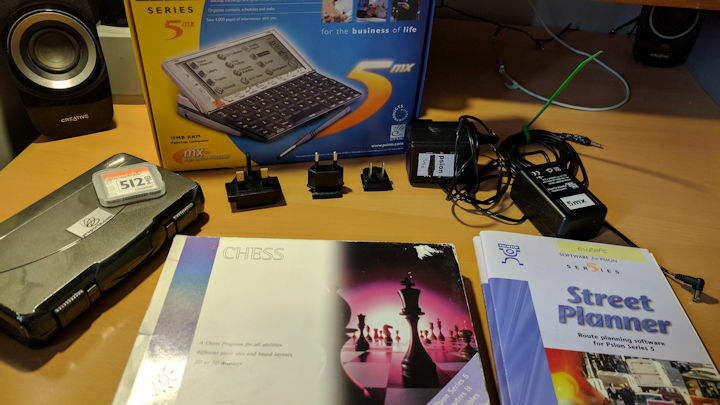 I bought a copy of PsiWin 1.1 (for £80) and connected it to my Windows 3.11 for Workgroups PC (a 386 SX-20). I used it to write and edit my masters dissertation in 1999. 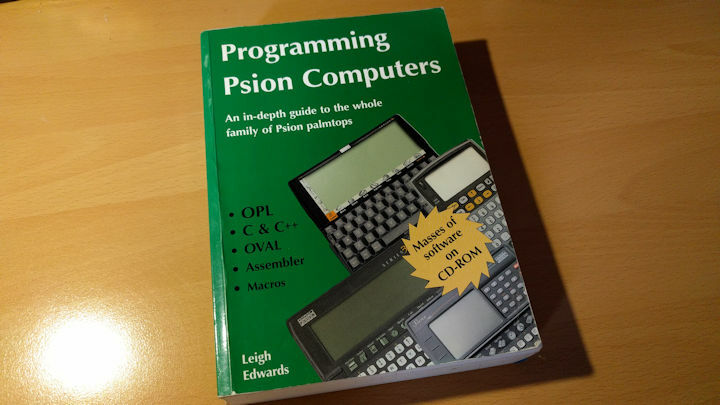 This book was the bible of Psion computing about 18 years ago. I managed to grab myself a copy in Waterstones bookshop on Edinburgh’s Princes Street, for £29.99. It soon became quite a rare book, and so the publisher, EMCC, made it available in PDF on their website, as well as a zip archive of the CD-ROM that accompanied it. Many years ago, I gave away the CD-ROM to someone who was desperate for a copy of the original. I’ve been meaning to list these for months, but only just got around to it now while I have my head in the selling-space as part of the divorce settlement. I feel sorry to see these go, but they are just sitting in a box in my cupboard and I would much rather they went to someone who got some pleasure out of them. Well, I guess everything has to end. It’s a shame though, but nice to see that you have’t forgotten us on your new site! I had that CD ROM image from you some time ago – sorted! Thanks indeed, I have the book and now the CD as well! 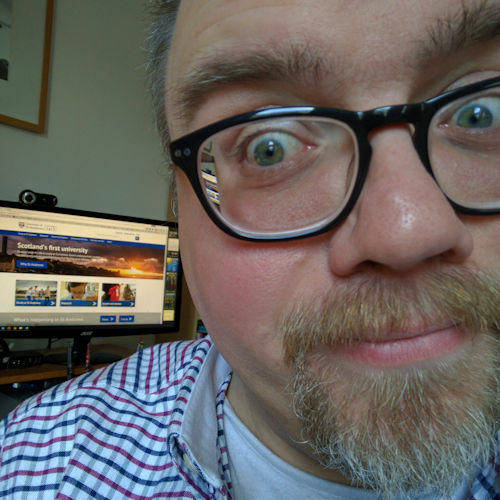 I’m writing a sort of very simple stock/asset management system for the Workabout MX with the laser scanner and these resources are vital, so thanks once again Gareth!